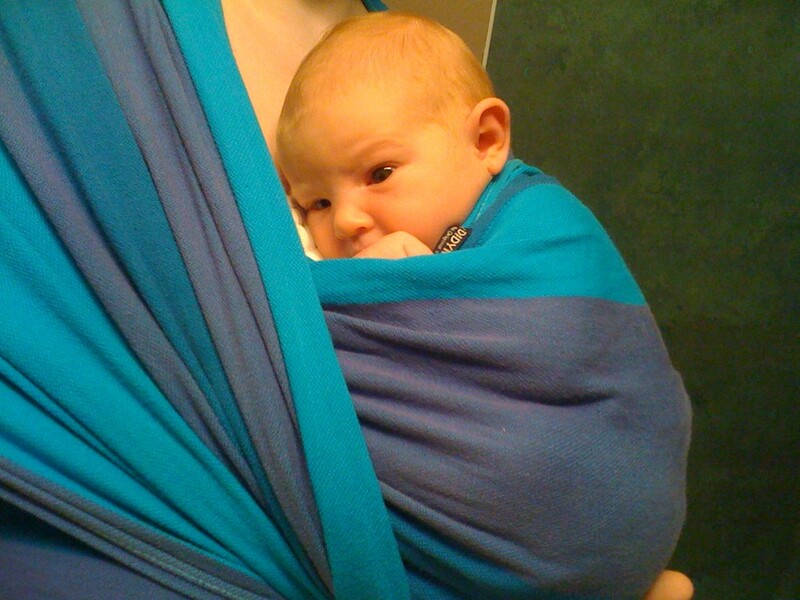 Babywearing is the act of carrying your baby hands free using a fabric carrier. Dr William Sears coined the phrase in the 80’s when his wife started carrying one of their eight children in a sling she’d made out of a bed sheet. She commented that she really enjoyed ‘wearing’ him, hence came the term ‘babywearing’. 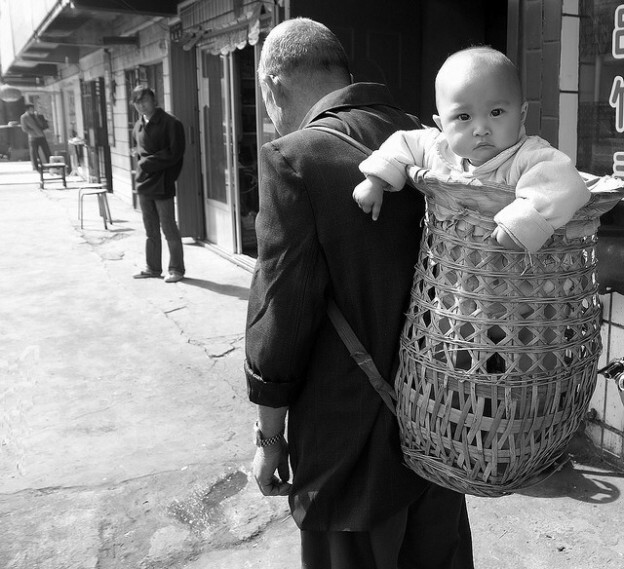 “Baby in a basket”: a traditional Chinese baby carrier. It’s a growing trend here in New Zealand and many other Western countries, but for many of the world’s people babywearing is what they have always done and continue to do. On arrival in New Zealand the British observed Māori carrying their babies on their backs, “…an old man (if not a chief) might be seen toiling all day at his work with his little grandchild strapped on his back.” (Tregear, E. 1904). Carriers were made from muka of the harakeke (flax). It would have taken weeks to make enough muka strong enough for a baby carrier. When the old army issue blankets became readily available to Māori they mostly used these as baby carriers. 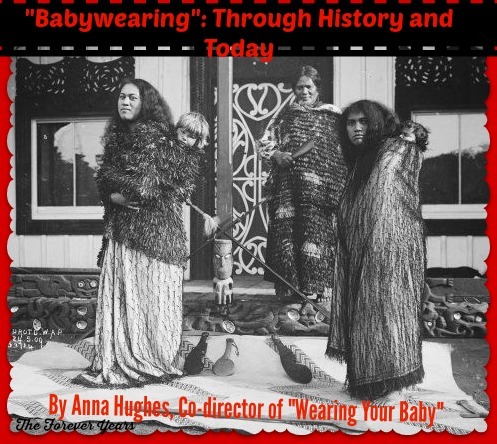 From the 50’s the practice of babywearing was rare in Māori society. Dr Fredrick Truby King’s Mothercare book and nurses who worked for the newly formed Plunket society discouraged the practice of even holding your baby more than necessary for fear of spoiling them or passing on germs that might cause sickness or death. It wasn’t until the 70’s that babywearing started to reappear in New Zealand and La Leche League played at integral part in the resurgence. LLL has always been a strong supporter of holding your baby close. With your baby secured against you in a carrier you are hands free to continue with jobs while still being able respond to your baby’s needs in the present moment, particularly that of breastfeeding. The Yequana people of the Venezuelan jungle: a mother wearing her baby. A pattern for the traditional Chinese Mei tai carrier was published in a NZ, LLL magazine in the 70’s. Along with the increased ease and decreasing cost of international travel, LLL being an international organization, provided information about how other cultures managed and treated their babies. Jean Leidloff’s book ‘The Continuum Concept’ was first published in 1975. After living with the Yequana people of the Venezuelan jungle for two years she questioned the way in which our Western culture was treating it’s newest members. She developed the idea of the ‘in-arms’ phase of a baby’s life. A time from birth to 9 months or more, when the ‘rightful’ place of a baby is in the arms of another human being. She believed a baby has an innate biological expectation to be held, “…just as our waterproof skin has the expectation of rain.” (Leidloff, J. 1975). Leidloff’s controversial book, still read by many expectant parents today, contributed to the return of babywearing in the West. The practicality of babywearing for parents is just one of many benefits. A study of Canadian mothers and their infants showed that babies who were carried more, (4.4 hours per day compared to 2.7 hours per day), cried for a significantly shorter amount of time “- a 43 percent difference.” (Barr, R.G. 1991). The frequency of crying was similar but the duration far less at the peak crying age of 8 weeks. A follow on study looked at whether increased carrying for babies labeled colicky at 8 weeks of age decreased the amount of crying for these babies.It was found that it did not. It might be concluded that increased carrying from birth may have a preventative effect when it comes to crying or colic. A recent study by Ken Blaiklock of Unitec Institute of Technology in Auckland showed that there is minimal interaction between a baby and parent when they are placed in a forward facing pushchair. Interaction and vocalizing increased slightly when the baby was orientated towards the parent but not many of these prams were observed. The conclusion was that interaction between parent and baby was at its highest when the baby was facing and at a similar height to the parent, notably when in a supermarket trolley. Although Blaiklock observed babies being carried there was no discussion of the levels of interaction occurring. Suzanne Zeedyk published similarfindings from her 2008 research in the UK. She stressed the importance of being able to see your baby to respond to their needs and to facilitate verbal interaction essential for language acquisition. Source for this photo: “Yummy Mummy”. Like everything you do or use with your baby there are some safety considerations you must know. The FITS acronym covers the main points. Your baby must be Firm against you, particularly through the upper spine with the base of the newborn or sleeping baby’s head supported by the carrier. This ensures the chin is lifted off the chest allowing for an unrestricted airway. Your baby needs to be In sight, sound or feel. The carrier or clothing should not cover your baby’s face. The Top of your baby’s head needs to be up at your neck height. This allows for easy monitoring and a more ergonomic carrying position for you. You must ensure your baby’s hips and spine are well Supported by the carrier. You can read more about this last point below. Wearing your baby helps them to regulate their heart rate, tempperature and breathing and decreases their stress hormones. This is why skin-to-skin contact during Kangaroo Care is so beneficial for a premature baby. With all this regulation done for them by their parent their immature little bodies can put energy into growing and healing. The same is true for the full term baby. The security that babywearing provides decreases the stress hormone cortisol. Cortisol levels of a baby increase during parent-child separation and intense crying. Contrary to historic belief, when a baby’s need to be ‘clingy’ is met they become more confident and independent in time. The bond and trust that is built up between parent and baby when a baby’s physical and emotional needs are met in the present moment helps the baby to validate themselves as an individual and gives them confidence that they are worthy. Babywearing allows the infant to be close to their parent who can continue with everyday chores. As baby grows babywearing allows them direct and active experience of the world from their parent’s perspective. Fathers find babywearing an empowering parenting tool. They have the ability to provide closeness, comfort and security from the time their child is born as well as having a way to give their partner a break and get their baby to sleep. 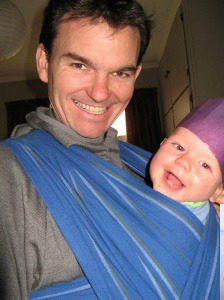 Babywearing is a powerful bonding tool for fathers and their babies. Carrying your baby in an upright position provides support to the immature digestive system. Gravity helps food move in the right direction. The upright position in a baby carrier is similar to the position a baby is in during biological nurturing; the main difference being that your baby is higher on your body in a carrier. In the Spring, 2012 edition of Midwifery Today, Suzanne Colson discusses Biological Nurturing, “..the approach in itself encourages mothers to keep the baby in the right place, what Nils Bergman (2008) calls the “mammalian habitat”. It is therefore not surprising that many mothers say BN helps them get to know their baby sooner.” In a baby carrier baby’s chest is against yours, with as much skin-to-skin as you choose, knees are tucked up above the height of their hips and slightly spread. The ideal baby carrier will firmly and securely support a newborn baby in this position known as the straddle squat or M position. Another benefit of this position is that it supports the correct development of the baby’s hips and spine. A baby’s spine is in a C shape when born. The upper spine develops its curve around 3 months when baby learns to control his head. The spine continues to develop as baby learns to crawl with the lower spine developing its curveas baby becomes a competent walker. A good baby carrier and carrying style supports the spine in the natural C shape, not forcing it straight, which may contribute to incorrect development. In the straddle squat position the head of the baby’s femur (thigh bone) fits correctly into the socket of the hip joint. In the opposite position with the baby’s legs pushed straight together or hanging straight down the head of the femur is being pressured outwards which may cause damage to the outer lip of the hip socket. Baby’s are checked for signs of Developmental Dysplasia of the Hips (DDH) by midwives and Well Child nurses in order to pick up on this condition and correct it before it causes long term damage and effects physical development. The treatment is a harness that lifts the knee to hip height and out to the side (the straddle squat position). A baby diagnosed with DDH may have to wear the harness for 3-4 months and in severe cases may need surgery. The upright position also takes the pressure of the baby’s soft skull. A baby who is always lying in the same position in a car seat or bassinet is at risk of developing flat spots on his or her skull. As most babies sleep lying down at night having day sleeps and daytime upright in a carrier provides a break from pressure on the skull as well as providing cuddles, closeness and bonding for baby and parent. In establishing breastfeeding babywearing provides the ideal situation of babyy being close and ideally in as much skin-to-skin contact as possible with mum. Initially it is best to remove your baby from your carrier when she wants to feed to ensure correct breastfeeding technique is established. When you are confident that you and your baby have breastfeeding sorted there are many ways you can feed your baby without removing them from the carrier. Babywearing provides so many benefits for both parent and baby. There are now a multitude of carrier types available on the market at varying prices. 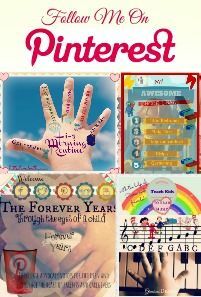 This can be overwhelming for new parents. Wearing Your Baby DVD and Download is a resource created to inspire parents to wear their babies. 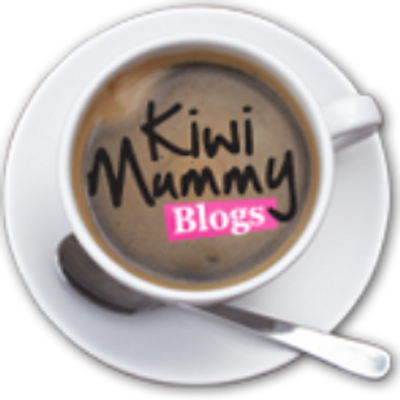 It has information on the safety aspectsof babywearing and includes step-by-step instructions on how to use the six most common carrier types in New Zealand. It also includes sections on wearing two babies and on improvising your own carrier, making babywearing affordable for all. Past LLL member, babywearing, co-sleeping, ‘nappy free’ and breastfeeding mother of two boys. Barr, RG., Hunziker, UA. (1986) Increased carrying reduces infant crying: a randomized controlled trial. Pediatrics. May 1986. 77(5):641-8. Blaiklock, K. (2013). Talking With Children When Using Prams While Shopping. In NZ Research in Early Childhood Education Journal. Vol. 16. Pp. 15-28. Colson, S. (2012). Biological Nurturing: The Laid-back Breastfeeding Revolution. Midwifery Today. Spring edition. Leidloff, J. (1975). The Continuum Concept. Tregear, E. (1904). The Māori Race.